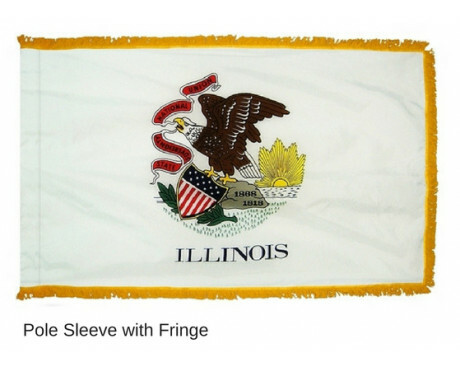 Illinois was a state for almost a century before the Illinois state flag came into use, but the flag makes use of design elements that are almost as old as the state itself. 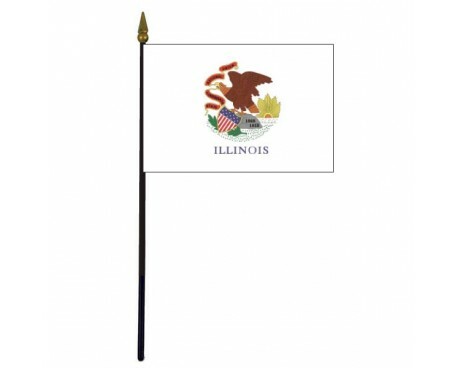 Illinois state flags consist of the state seal above the state's name in the center of a solid white field. The flag's simple field serves to emphasize the importance of the state's seal, which consists of a bald eagle that is perched on top of a rock and holding a banner with the state's motto in its beak. An olive branch and a shield that is decorated with the tars and stripes of the American flag are alongside the rock. The seal's design was inspired by the Great Seal of the United States, which emphasizes the state's link to the rest of America. The combination of the state's motto with symbols of the entire country embodies the state's dedication to a united country that respects the rights of individual states. 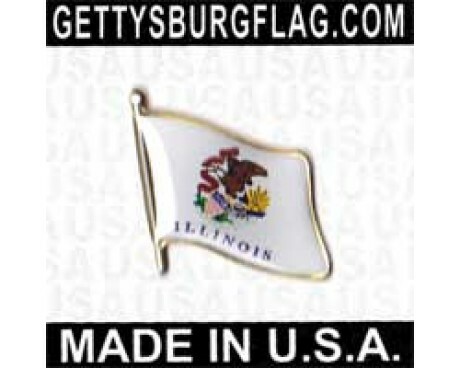 Illinois state flags are dominated by the state's seal, which was first adopted in 1819, only one year after Illinois was admitted into the Union as a state. The 1819 seal did not remain in use for long before it was changed. The first change occurred in 1839, and a second change was made in 1867 to create the design that has been used ever since. The seal predates the Illinois state flag by almost a century. 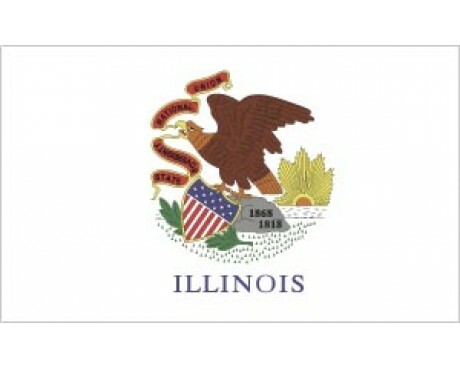 The movement to design a state flag for Illinois began in 1912, when Ella Park Lawrence began to lobby the state government. She eventually held a contest for the members of the Daughters of the American Revolution to design a flag. She received thirty-five submissions, and the winning design was adopted by the state government in 1915. 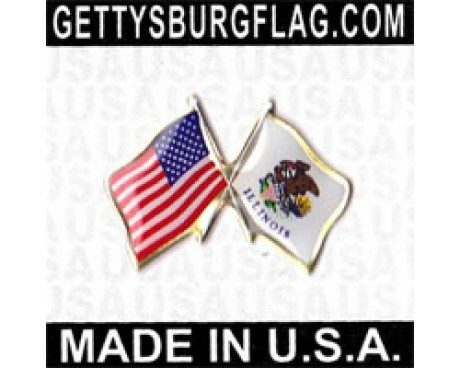 The flag represented Illinois for most of the 20th century before it underwent any changes. The state's name was added to the bottom of the flag in 1969 in order to make the design easier to recognize, and that change created the design that is still in use today. The American Eagle was already being shown on the seal of Illinois even when it was only a territory. Illinois was admitted to the Union in December 1818. The eagle holds in its beak a flying red scroll bearing the state motto "State sovereignty, national union", and stands on a rock with a leaning shield containing the Stars and Stripes. On the rocks are the dates 1818 and 1868, and behind the shield is a laurel wreath. During this time a suggestion that the two phrases of the state motto be reversed, was defeated. However, the person cutting the seal cleverly arranged the scroll so that the last two words of the motto are read first. The object of reversing the phrase was actually achieved. The Daughters of the American Revolution organized competition for the design of the state flag in 1915, and some members from Rockford, Illinois submitted the winning design. In July 1970, the name of the state was added beneath a fuller colored version of the state seal. Illinois is really a Mississippi valley state, which also borders on Lake Michigan . First explored by the French in 1673, and belonged to French Louisiana. Part of the Indiana Territory ceded by France to Britain in 1763, conceded by Britain to the USA in 1783. Became a territory in 1809, admitted to the union on December 3, 1818.